Living in a fast-pacederahave made our lives easier but sometimes we don’t feel the best when surrounded. And the biggest example one can address to this situation is your home. Owning your dream home is something we all live for. But the growing population in metro cities have made the standard living, a bit crowded. You might get the best of interiors with these locations but there is always a connect with nature that keeps missing. Proper sunlight and ventilation is the key to healthy housing. But this cannot be achieved with tall buildings aligned next to each other. But, what if you can get the same residential unit next to Himalayan ranges? 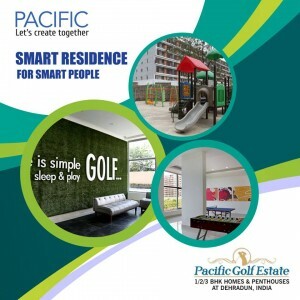 Pacific India made this dream project come true in the face of Pacific Golf estate offering 1,2,3 & 4 BHK apartment near Pacific mall Dehradun. The project features the best of a lavish residential experience equipped with all kinds of modish amenities like club house, swimming pool, sports area, & much more. What makes this beautifully designed architecture more amazing is its prices. The project has already received so much love with its timely delivery of phase-1 that it is completely sold out. This 35-acre of green land comprises of a 9-hole signature golf course by Ace Golfer Graham Cooke. One of the other biggest comfort that project has planned for you is easy connectivity. Marked as one of the best property near Pacific mall Dehradun, the group has already offered possession for its 2nd phase. Being one of the biggest giants in construction sector, this dream housing project aims at providing the finest residential experience to people at the most nominal prices, without burning their pocket. The group’s ideology also explains the same story which believes in providing an ideal home to the audience because everyone deserves their dream home.